Lüneburg is worth visiting at any time of the year because of its gorgeous gothic red brick style of architecture. 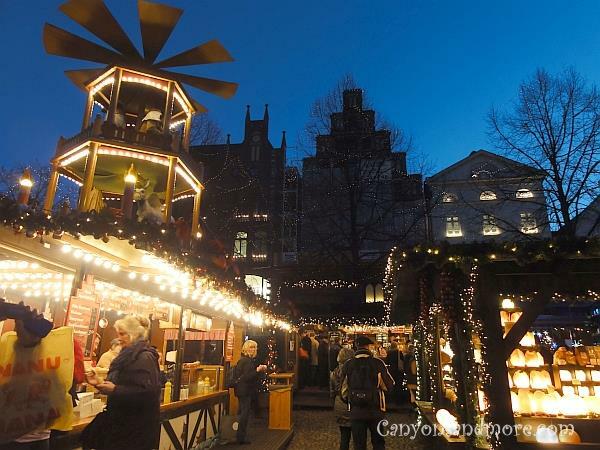 During the Christmas season, another highlight of the city is the Christmas market. 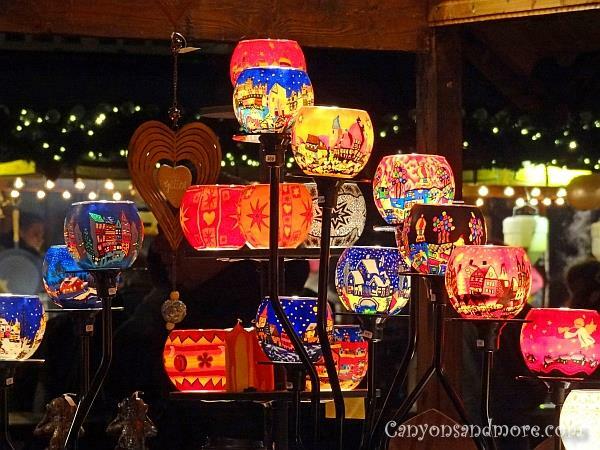 The main market is located at the market square lights up with a delightful Christmas feeling. Overlooking the market is the grandiose city hall which adds so much flair to it. 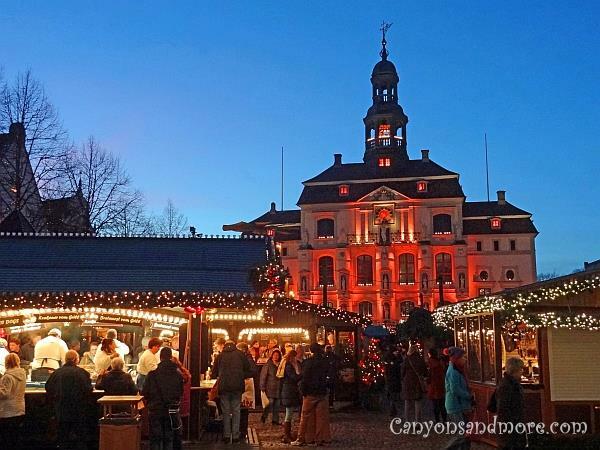 Not only is the Christmas market a reason to visit Lüneburg in December, but the city itself festively decorated for the holidays and it is a pleasant place to spend a day doing Christmas shopping and enjoying the architecture. There are several small historical medieval streets which are inviting to walk down and imagine how life was as these structures were being built. Many of the buildings are crooked which only adds to their charm. If you want to see the city from above, you can go up to the top of the water tower. It may be cold in December but the view overlooking Lüneburg is amazing and worth the look. 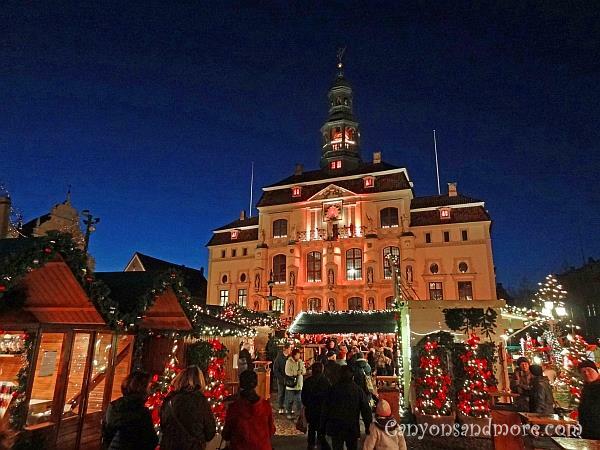 The image above shows a view of the beautiful Rathaus (City Hall) with the Christmas market in front of it. The Rathaus was constantly changing colors in the background. It was glowing from yellows, to oranges, to reds and then to blues and was a highlight of the market. 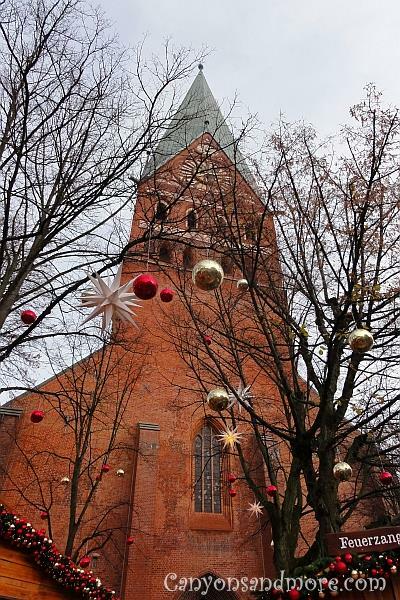 The Sankt Johannis Church stands proudly in the city of Lüneburg. Just out front of the church there is a very small and quaint Christmas market selling mainly food and drinks at the wooden stalls. It is quiet and a little away from where the hustle and bustle of the city is and a nice place to meet up with friends to chat a bit. 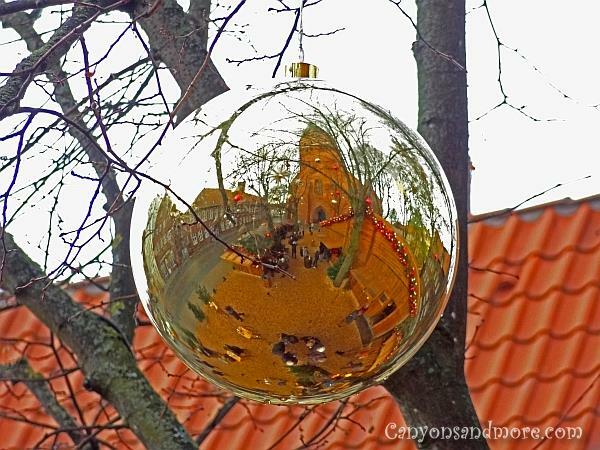 This is an unusual view of the market at the Sankt Johannis Church. In the trees above it are many hanging ornaments and stars. The ornaments are huge and you can actually see the reflection of the market and the church in the background in these decorations. 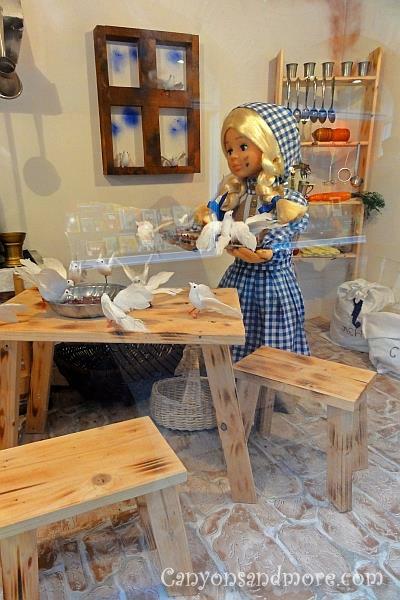 During Christmas 2013 there were fariy tale cabins set up throughout the city. These were created for the children and at each hut the kids could stop and watch the movable figures perform the fairy tale they are representing. A recording tells the tale so all can listen to it while watching. 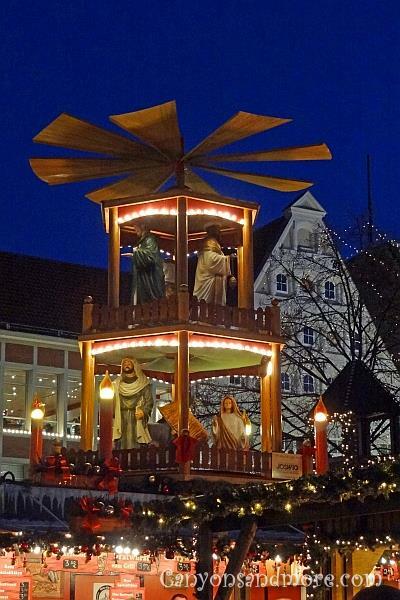 Many larger Christmas markets have their own wooden pyramid and Lüneburg is no exception. 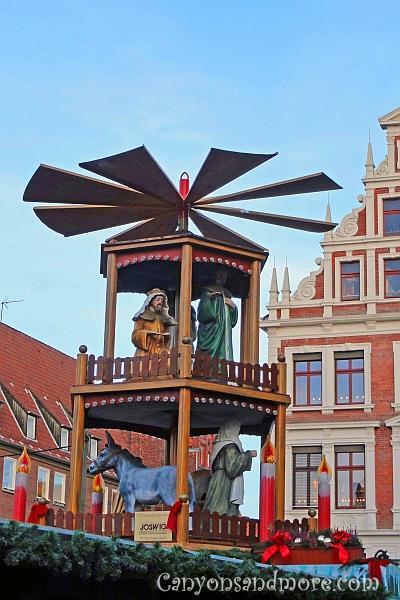 The figures usually represent the nativity and the pyramid is nomally situated on one of the booths, high above the market so it can be seen well. The pyramids rotate constantly, just like the smaller versions that normally turn due to the heat of the candles. It normally gets dark at the latest at 5 p.m. in the winter in this area and now the market has a new glowing feeling to it. All the booths are lit and look inviting as well and the wooden pyramid has a rustical look to it in the light. Proudly overlooking the market and providing a wonderful backdrop at the same time is the most impressive city hall building of Lüneburg. While visiting the market, a man playing the trumpet was on a high location of the Rathaus and playing German holiday tunes. The music gave the market a wonderful old fashioned Christmas flair. Candles go very well at the Christmas markets everywhere. It is the desire to add light to the darkest time of the year. These candle holders out of polymer clay with their brilliant colors just seem to be asking to be bought. Some of the motifs are of the city of Lüneburg and are a great gift to give someone as a souvenir. At the main Christmas market, there were treats enough to make any kid or adult happy. 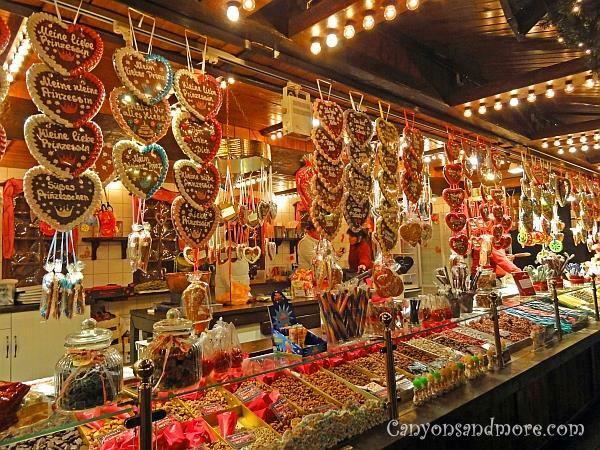 You will find a stall like this also at every Christmas market selling candied nuts, Lebkuchenherzen (the gingerbread hearts you see hanging) and tons of sweets of all sorts. It was entertaining just strolling slowly through the passageways between the market stalls. The sweet scent of mulled wine was in the air, a music band was playing Christmas tunes in the background on that particular day and many people met up with their friends to have an enjoyable evening with them.